CGAL (Computational Geometry Algorithms Library) is a comprehensive library of geometric algorithms. The goal of CGAL is to advance the state of the art of geometric computing and to offer robust and efficient programs for research purpose and industrial applications. The initial development of CGAL is a joint effort of six groups in Europe partially funded by European Projects. The library consists of about 500,000 lines of C++ code with users all over the world. Since november 2003, CGAL is an Open Source Project. The spin-off Geometry Factory sells CGAL commercial licenses, support for CGAL and customized developments based on CGAL. 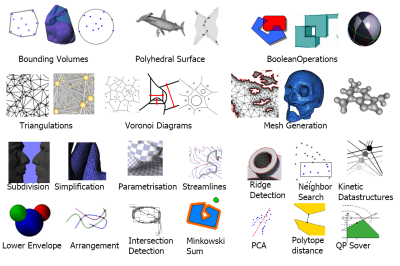 GEOMETRICA is currently working on a CGAL kernel for curved objects and CGAL components for non-affine Voronoi diagrams, 3D periodic triangulations, 3D mesh generation and surface reconstruction. Starting from March 2009 the triangulations of CGAL have been integrated into MATLAB R2009a, as a follow-up of a contract between TheMathWorks and GeometryFactory. Check here for examples using Delaunay triangulations. CGALmesh is a 3D simplicial mesh generator. It provides isotropic tetrahedron meshes for domains or multi-domains bounded by curved or flat, smooth or piecewise smooth, surfaces. Visit the CGALmesh web site for more information. CGALmesh was developed with the support of INRIA ADT CGAL-mesh.